Hypothetical situation: seven castaways have been living on an uncharted island in the Pacific for 15 years after a shipwreck. One member of the group is an eternal screw-up, the constant thorn in everyone's side, and one day the Skipper finally snaps. And the very next day a Coast Guard cutter shows up out of the blue and rescues the rest of the gang. What is the Skipper's fate? Can a person be tried for a murder committed in an unclaimed land where there technically is no law? Such was the dilemma faced by the U.S. Justice Department when a technician shot and killed a meteorologist on a remote Arctic ice floe in 1970. The ice island known as T-3 was approximately seven-miles long and three-miles wide when a 20-man group of researchers arrived there in May 1970. The kidney-shaped ice floe floated rather aimlessly in a clockwise direction around the Canadian/Alaskan sector of the Polar Basin. Despite its extremely remote and frigid location (the average temperature hovered around -40Â°F), the men had trailer homes and research huts that they made as cozy as possible—some would later describe it as a "frat house" atmosphere—for the duration of their five-month assignment. 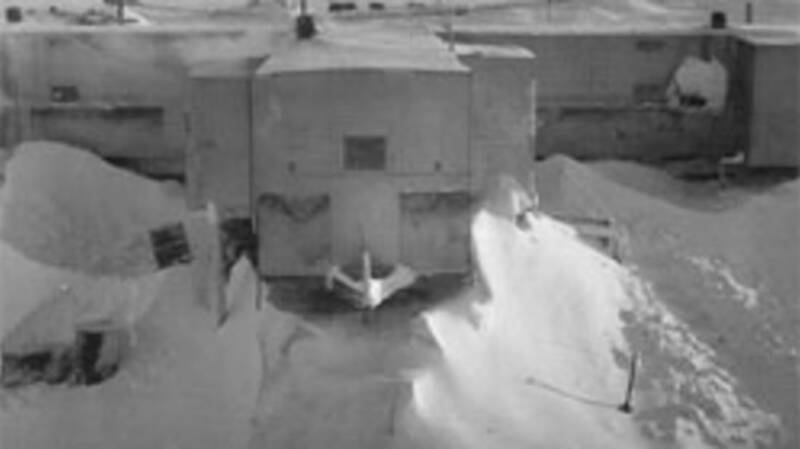 Bennie Lightsy, an Air Force veteran and employee of the United States Weather Bureau, had been designated the station manager by the Arctic Research Laboratory. Also stationed there were Donald "Porky" Leavitt, another Arctic Research Lab employee, and Mario Escamilla, an employee of General Motors Defense Research Laboratory. Had extensive background checks been commonplace in 1970, Porky Leavitt probably would not have been assigned to such an isolated post. Unbeknownst to his co-workers, he had a serious drinking problem. Booze was not unheard of on the island, but it was available in limited quantities depending upon how much the supply planes brought in. The researchers paid for luxury items like liquor out of their own pockets, so they were naturally protective of their individual stashes. Porky apparently drained his own supply (small cargo planes can only carry so much) so quickly between deliveries that he threatened fellow researchers with a meat cleaver on three separate occasions in order to gain access to their alcohol stash. On the afternoon of July 16, 1970, Mario Escamilla was working at the GM hut when he received a phone call from his roommate, Charles Parodi. Parodi warned him that Porky was on a bender and had stolen Escamilla's jug of homemade raisin wine. Escamilla went first to the station's common "store" and grabbed a rifle and loaded it, mindful of Leavitt's previous violent outbursts. He burst into Leavitt's trailer where he found Porky and Bennie Lightsy drinking a combination of 190 proof ethyl alcohol cut with grape juice and Escamilla's raisin wine. Escamilla retrieved what remained of his wine, warned the two to stay out of his belongings and returned to his trailer. Shortly after Escamilla returned to his trailer he heard footsteps approaching, and assuming it was Porky (and being well-acquainted with Porky's violent streak), picked up the loaded rifle. The person approaching was not Porky Leavitt but Bennie Lightsy (pictured), who allegedly began to argue about the "selfishness" of Escamilla regarding his raisin wine. No one but Mario Escamilla knows for sure what happened next, but according to him, while he was arguing with Lightsy, he also gesticulated with the rifle. He accidentally bumped the rifle during the discussion and it fired. Lightsy was hit and died shortly afterward, despite efforts by Escamilla to stem the bleeding (there were no medical personnel on the island). After U.S. government personnel were advised of the crime, Escamilla airlifted by helicopter—a meticulous maneuver that involved in-air refueling over the Arctic Ocean—to Thule, Greenland, where he was then transferred to an airplane and flown to Dulles Airport. That disjointed return home was just one of many factors that made Escamilla's resulting trial so difficult from a legal standpoint. Bennie Lightsy's death occurred on a floating island that didn't technically belong to any nation. At the time of the crime, T-3 drifted mainly in the Canadian sector of the Arctic Ocean, but the personnel involved were all Americans. And then there was that clause in International Law that stated an offender should be tried in the district into which he is first brought (in Escamilla's case, that meant Greenland). Many months of legal wrangling ensued. Canada eventually decided not to get involved and left the decision to the United States. It was ultimately decided that the floating ice island would be considered a "vessel" and that the case would be heard in Federal Court in Alexandria, Virginia, under the auspices of standard U.S. maritime law. One of the most influential pieces of evidence entered on Escamilla's behalf was the rifle that fired the fatal shot. It was run through standard ballistic tests and was found to be defective—the gun discharged when bumped against a solid object, with no finger near the trigger. This finding gave credence to Escamilla's claim that the gun had just "gone off" while he was arguing with Lightsy. Along with the literal smoking gun evidence, the defense also presented a parade of character witnesses who swore that Escamilla was an easy-going, non-violent man. The jury found him guilty of involuntary manslaughter and the judge sentenced him to three years in prison with parole possible after three months. Judge Oren R. Lewis added a provision to the sentence: Escamilla could be released any time after 60 days and his sentence would be stayed depending upon the outcome of his appeal. Escamilla's attorneys did eventually successfully appeal his sentence by questioning the legality of the definitions of many key terms used during the trial, such as "vessel" (can an ice floe really be considered in the same category as a ship?) and "ice floe" (what's the difference between an ice island and an occupiable ice floe?). Mario Escamilla never went back to jail after those initial 60 days and now lives in California. Ice island T-3 ultimately exited the Arctic Ocean via the Fram Strait and broke up off the coast of Greenland in 1984.